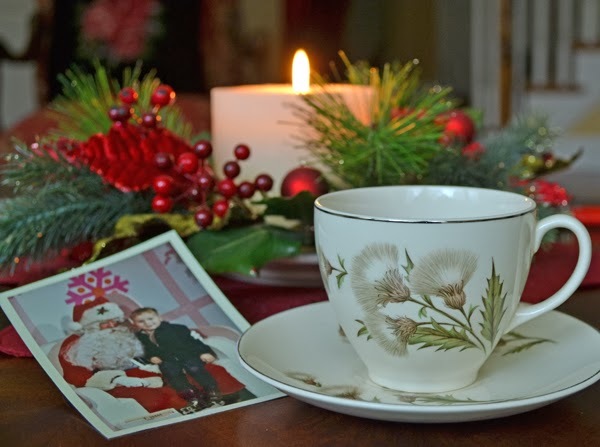 Your JB Thistle teacup and matching pieces are so pretty for this time of year. I love your little bleached trees too! I am bleaching some myself these days. Your candle in the background is just beautiful and lends a lovely glow to your setting. Thank you for sharing this with my special Christmas Tea and thank you for hosting. Have a splendid week, my friend. I love thistle patterns too, and I love the brush trees! So cute! I haven't heard of Tin Roof teas before...is it local from your area? Sounds intriguing. I use family dishes at the holidays as well. So precious! Thanks for hosting! 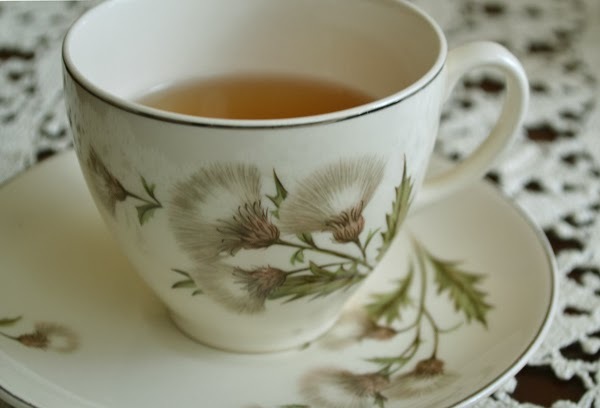 Oh what a gorgeous set of Thistle patterned tea cups. Never seen them before but I love the simplicity of them Terri. For Christmas I just love to pull out our white Alfred Meakin dinner set with its cobult blue and gold edged border and setting it up on a beautiful white damask linen tablecloth! It is some of the finest dinner ware we have. Thinking of you dear Terri in your travels. 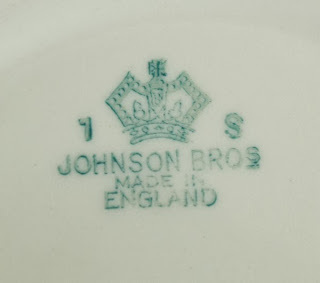 That is a really pretty Johnson Brothers pattern. I haven't seen it before. How lucky you were. 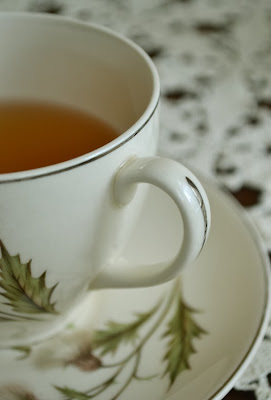 Thank you for hosting Tea Cup Tuesday! Have a great week! Stopping to wish you a beautiful Christmas. Your photos are lovely, you always capture sweet peaceful moments. Your teacup is so pretty. Haven't seen one like it before. What is it about Johnson Bros? I don't think they've ever made anything I didn't like! I think your new thistle is wonderful for the season. Are those the trees you made last year? I'm off to look at Tin Roof tea. Happy Happy and a Merry Merry! you are absolutely right. The thistle pattern reminds me to winter, too. So lovely to see with your decoration. The brushes trees look fabulous as background. Thank you for sharing this eye candy and for hosting this sweet event. Have a blessed Advent time. I love your sweet christmas trees, in your picture, and so cute it is in the the little cup. The thistle pattern, is beautiful and even no gold or red, it is so lovely for christmas ! Sending you hugs and a happy tea tuesday!! I love all the creamy white tones, soft greens , and thistle has always been one of my favorite plants, oddly enough, I find it so interesting. Hope you you are well my friend, missing you. Love your beautiful posts! Hugs! Wow..gorgeous seasonal tea and pattern...lovely photos..love those enchanting trees with the cup..so beautiful! always visually-creative..always magical! Hugs and blessings..thanks for such a festive tea today..and sounds like a super yummy blend you are drinking! enjoy! 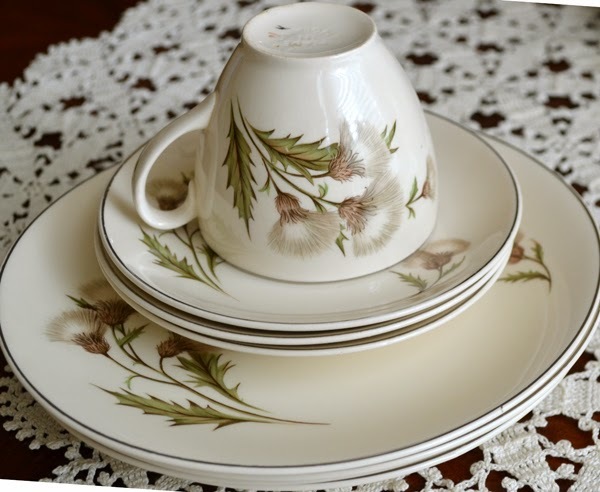 I like the thistle china for tea this week Terri and the oval luncheon plates appeal to me as well. Thanks for sharing these beautiful photos! This is my favorite time of year, but I've been too busy to be able to slow down and enjoy it. Your photos brought some calm and peace this morning. I do love the delicateness of the painting of the thistles on your lovely cup Terri! Your festive displays are beautiful too! What a pretty tea set, Terri. I love the bottle brush trees too. What a nice tea for Christmas! What a beautiful post Terri. 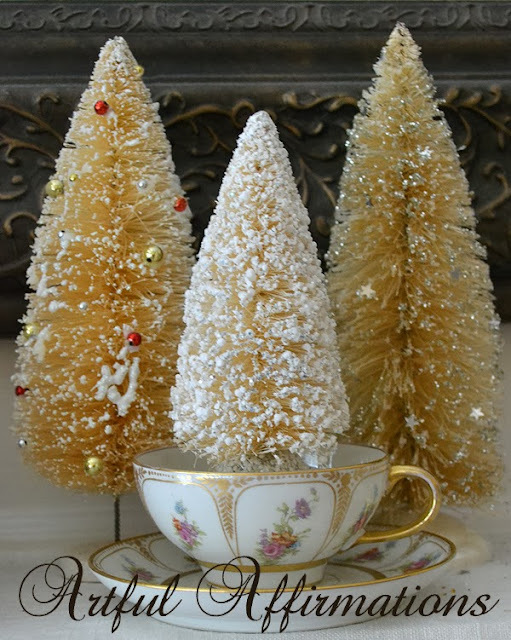 Love the vintage trees and teacups are so divine. Merry Christmas! Hi Terri, I'm a JB fan and have never seen the thistle pattern. It's so nice and your pictures a lovely. I love thistle anything...not sure why. Blessings, Terri! Love your thistle pattern, too - Johnson Brothers, of course. I love so many of their patterns - such a warmth in the appeal of their artwork. Your photography is always so inspiring - just beautiful! Ustedes en el hemisferio norte hacen de la Navidad un culto, nosotros somos más frios, es por eso que yo ne he publicado nada al respecto. Te felicito por todo lo que nos enseñas, he aprendido mucho. You sure know how to find those awesome treasures, Terri!